We left Mud Island on Memorial Day, motored towards Port Aransas to top off our fuel and water tanks and pick up some ice with the intention of heading offshore to Port Isabelle. I had on my Trans-derm Scope patch to ward off seasickness and was enjoying the motor up the Lydia Ann Channel talking to Melissa on the cell phone, when our engine sputtered to silence. "gotta go Melissa, the engine quit".... We quickly threw up the sails and long story short, ended up being towed to the long dock in the Port A Marina after more than a half an hour's struggle against the current. We would be spending our week in Port A instead of Port I! I've been so mentally beat up at work, I just didn't have the energy to work on an engine... until Thursday! We just made ourselves at home, sat around reading, snacking on junkfood and generally relaxing. 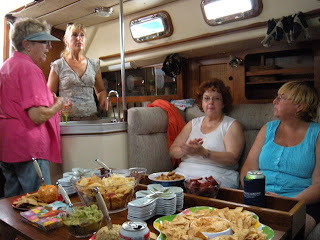 We had dinner with Laura and Mark one night, invited Keith from SV Rosie to dinner I cooked on board another night. We took a long bike ride one day out to Charlie's Pasture, where the City of Port A has constructed a really nice nature trail. A boardwalk zig zags out onto the flats where you can find birds and all kinds of critters. We even saw a jack rabbit! We stopped to check him out and he stopped to check US out... then he did what jack rabbits do... he high tailed it! We were on a grand adventure. It felt like we were in Mexico or some other far off land, instead of in our own back yard. We took a break at the end of the line, where there stands a lookout tower. From the top we could see for miles around. The wind was fresh on our hot faces. The scent of nature was all around. That means salt flat smell and bird poop! I'm not complaining!!! We took the long way home by way of the beach and the grocery store just like tourists. On about Wednesday, we drove over to the Jetties to try snorkeling. The winds were down and the water looked like it might be a good day for visibility. I was the first one in but it wasn't great. I couldn't see three feet in front of me. This activates my sea monster phobia so out I got. Bruce stayed in long enough to troll up the jetty far enough to determine that no, you couldn't see much. So off we went to find something else to do. There was rain forecast for sometime Wednesday night into Thursday. Before we went to bed, I checked the radar on the iPhone and it showed a giant red blob moving in our direction. Bruce did some quick retying of lines and battening down of hatches and we retired. Not long after that, we were awakened when the boat heeled over from the initial strike of the wind, followed by many more nods and violent rain and lightning. We watched out the side port windows as the blue flashes illuminated the vision of birds tumbling across the sky and the jib on Scorpia as it began to unwrap from the forestay and flap to tatters. The night was crazy, but in the morning there was minimal damage. There were reports of 70 mph winds. My poor husband had to pull the dinghy around until I thought we had reached exactly the right spot to drop anchor. I have a tiny little fear of sting rays when walking along sandy bottoms. This doesn't seem to effect him, so he gets to pull the dink. We played "Dessert Island" until the ship traffic made enough waves to annoy me on the shore... I've got no more places to put shells so I've had to quit beach combing. We waded back out to the dinghy to relax and watch the dolphin and the birds doing their thing. I love to lie back in the cool water with the sunshine on my face and watch the brown pelicans soar on the updraft from the little island. Ahhh there's nothing like it! It took me 4 or 5 days into this vacation to finally really relax! We spent the rest of our time taking walks, or not taking walks. Oh we did actually get the engine fixed. That involved Bruce tearing out things from storage lockers and pulling the stairs out of the doorway. It also involved me climbing down into the lazarette on the port side and getting into a position that was very nearly on my head, in order to help him bleed the fuel lines. The problem turned out to be just that. A side effect of the recent fuel filter change. Lesson learned! We took another bike ride later in the week before we left for the next stop on our journey. We visited the nature path over by the University compound. They have built a habitat viewing path which is very nice. We tidied things up on Friday and sailed up the Ship Channel. Not for home, but for one final stop. We spend Friday night at IOB anchored out next to Ken and Carrie. They had weathered the storm well enough but were dragging the bottom in search of the stuff that fell out of their dinghy when it went flying during the blow. We were well into cruiser mode by this time and did nothing but read and snack in the cockpit while we enjoyed the cool breeze under the shade of the biminy during the heat of the afternoon. 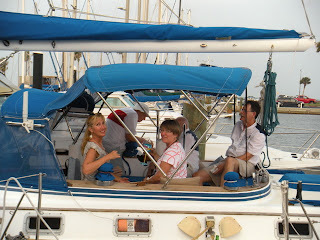 We went ashore to meet up with Steve and Jacque in the late afternoon. We spent the pleasant sun downing hours listening to other sailor's stories and the Sailing Minstrels as they strummed and sang. You just can't pay for entertainment like this. Saturday morning we headed for our slip in CC. Vacation was over and we were back to "just another weekend". 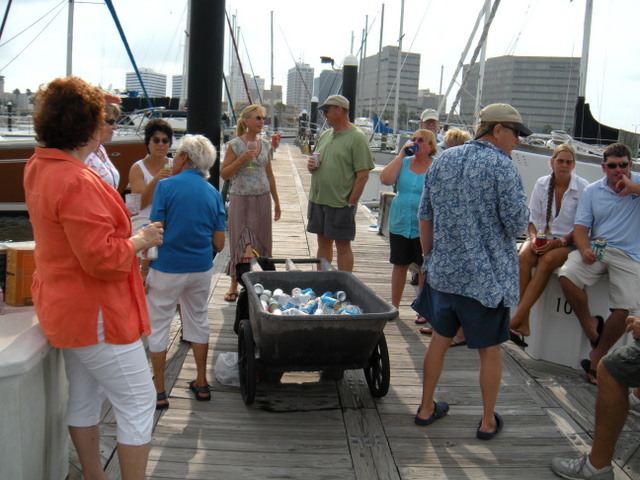 I had volunteered Elan to be a Host Boat for this year's BYC Dock Crawl (providing we were back from Port Isabelle). We spent the day offloading all of our stuff from living aboard for the week and cleaning the funk. It was a busy day but we were ready when the festivities began. After we did out duties as host/hostess, we were free to join the crawl. We caught up with the Beer/Wine wagon and toured the other boats. There were quite a few that we had never seen the insides of and were anxious not to miss a thing. It turned out that going first was a good thing. 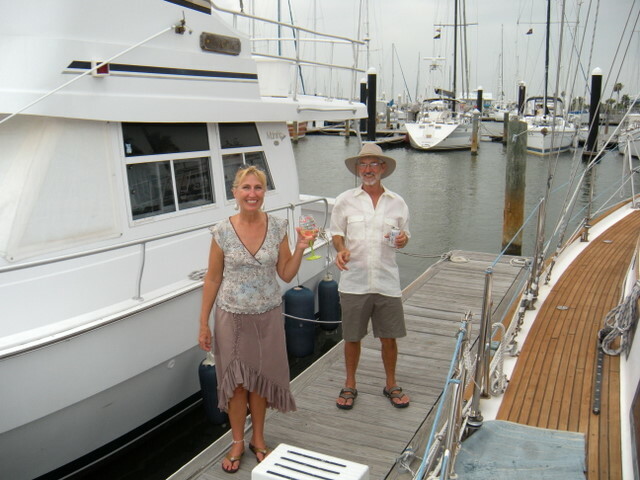 We made our way to the end of the line which was back at the BYC Clubhouse. Jake and Jenny's boat is parked right out front. They get my vote for the best snackers. They had ribs that were to-die-for and we got the last of them. I think we need to have a rib cook-off at the club. I know of several men who do a phenomenal job with ribs! We escaped back to our boat when the party moved into the Clubhouse for dessert We had reached our revelry limit for the day. You might think that after a week aboard a sailboat, we would be ready to hide out in our nice cool Townhome on Sunday... but no! We had a car in Port Aransas and when we saw that Harry and Linda were preparing to shove off to motor their trawler back to Port A, we jumped aboard. This meant spending ANOTHER day on the water, but on the other hand, it meant spending another day ON THE WATER!!! Woo hoo! We relaxed and enjoyed this one as we rocked and rolled across the bay and up the channel to Port A again! We docked and rode Harry's golf cart to lunch at the Beach Bar, where we thought we would never be served... said our goodbyes and Thank Yous and drove back to the CC Marina, where we were sucked into spending the last remaining hours of the day and into the night, aboard Merlin for cocktails. We wrung every last little drop of my time off from work and made it all outstanding! Maybe next year we'll get back down to Port Isabelle, but for this year... Port A did the job!